Knopf Publishing Group, 9780307273581, 494pp. From the prizewinning biographer of Richard Yates and John Cheever, here is the fascinating biography of Charles Jackson, the author of The Lost Weekend—a writer whose life and work encapsulated what it meant to be an addict and a closeted gay man in mid-century America, and what one had to do with the other. Charles Jackson’s novel The Lost Weekend—the story of five disastrous days in the life of alcoholic Don Birnam—was published in 1944 to triumphant success. Within five years it had sold nearly half a million copies in various editions, and was added to the prestigious Modern Library. The actor Ray Milland, who would win an Oscar for his portrayal of Birnam, was coached in the ways of drunkenness by the novel’s author—a balding, impeccably groomed middle-aged man who had been sober since 1936 and had no intention of going down in history as the author of a thinly veiled autobiography about a crypto-homosexual drunk. But The Lost Weekend was all but entirely based on Jackson’s own experiences, and Jackson’s valiant struggles fill these pages. He and his handsome gay brother, Fred (“Boom”), grew up in the scandal-plagued village of Newark, New York, and later lived in Europe as TB patients, consorting with aristocratic café society. Jackson went on to work in radio and Hollywood, was published widely, lived in the Hotel Chelsea in New York City, and knew everyone from Judy Garland and Billy Wilder to Thomas Mann and Mary McCarthy. A doting family man with two daughters, Jackson was often industrious and sober; he even became a celebrated spokesman for Alcoholics Anonymous. Yet he ultimately found it nearly impossible to write without the stimulus of pills or alcohol and felt his devotion to his work was worth the price. 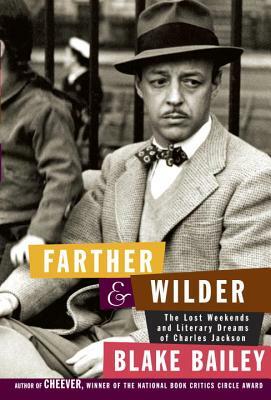 Rich with incident and character, Farther & Wilder is the moving story of an artist whose commitment to bringing forbidden subjects into the popular discourse was far ahead of his time. Blake Bailey is the author of "A Tragic Honesty: The Life and Work of Richard Yates," a finalist for the National Book Critics Circle Award, and "Cheever: A Life," winner of the National Book Critics Circle Award and the Francis Parkman Prize, and a finalist for the Pulitzer and James Tait Black Memorial Prizes. He edited a two-volume edition of Cheever's work for the Library of America, and in 2010 received an Award in Literature from the American Academy of Arts and Letters. He lives in Virginia with his wife and daughter. "A great American biography ... brilliant and gripping ... Mr. Bailey has made an author come alive in a way that is truly novelistic, has made him submit to becoming a character in a story. . . .a Greek myth crossed with a Sherwood Anderson tale. . . . That Blake Bailey should come along 45 years later and grant [fame to Charles Jackson] is a kind of miracle, one that we can all be grateful for." --Adam Kirsch, Wall Street Journal"
"Arresting ... Bailey is the literary biographer of our generation.... [his] biography shows us the artfulness of Jackson's life and work: the self-consciouness, the refusal to take anything for granted. ... The publication of this new biography and the reprinting of the books themselves ignite the excitement once again, and Bailey has given us a writer who can, on every page, throw us out of our chairs." --Seth Lerer, San Francisco Chronicle"